Although things slow down a bit once the weather gets nice I am still quilting away, but this particular quilt seems hard to photograph. Nonetheless, in the interests of record-keeping if nothing else, here are a couple of pictures. Linking with Slow Sunday Stitching at Kathy's Quilts. Oh, I especially love the rays of light beaming from the lighthouse! Your wonky tower is delightful and words tucked in here and there always add interest. I also enjoyed your discussion in the last post about getting familiar with your recycled fabric. I feel the same about scraps. sometimes one little thing will grab ones attention and start an idea.... cheers! So fun how you quilted the top of the lighthouse! Reminds me of the book "The Light Between Oceans". And of course I love that you are stitching with different thread colours! Oh I'm pleased the quilting is coming along on this quilt, love the quilted beams of light. The quilting looks lovely! You are on a roll this year with the amount of quilting you are getting done. Great hand quilting, Kaja. The blues with red mix are attractive, thanks for sharing. Love your free pieced lighthouses - and the way you set them into the quilt top. Happy stitching! 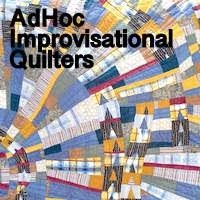 I didn't know you started quilting this one already. Quilted light beams coming out of the tower looks wonderful. The way you've quilted the lighthouse light is very effective. This is such a wonderful quilt. I need to document the lighthouses here, too. Lovely stitches. Such a cool tower!